I LOVE IT! I have a few of the trees and apples, too, and quite possibly for the same reason! More will be revealed. We love our black sheep, don’t we??? In addition to all the other things our families do for us, they sometimes keep us entertained—both the living ones and the ones who are no longer living!?! That they do, Mary Ann! That they do! I love your family too, Judy 🙂 It’s great the way you relate your stories and incidents. Aw… thanks for the kind words, Brenda! Love this one too….my great grandmother Elizabeth “Betsy” (Boyer) Worden is my great great grandmother’s second cousin (Lydorianna (Boyer) Worden. Low in behold Lydorianna is Betsy’s mother-in-law! I am so entertained by my family. heehee! Great write up Judy! Keep them coming. Got a LOT of those too, Shelley — cousins by the dozens! Please check me on this but in the 1950s, I believe Kentucky had a waiting period and blood test requirement for getting a marriage license. Indiana did not. It was rather common for people in Kentucky who needed to get married quickly to go across the Ohio River to one of several popular places in Indiana where they could get married the same day. 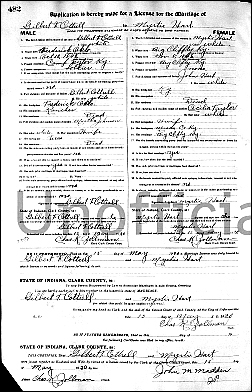 If the laws were similar in 1920, this could explain why your ancestor went to Indiana to get married the first time. I’d have to check the exact laws, but that would be one reason — another possible reason was trying to avoid the military authorities if he needed and didn’t have his commander’s permission to marry. I know at various times they’ve required permission for enlisted men to marry, not sure about this time frame. Yep, I definitely have some trees and apples in my family line as well. They are so much to research! We must be cousins for sure. My Grandpa Cottrell became one of the subjects of a thesis for a gal on a study of men who robbed the plains farmers during the depression because the hid their money at home instead of using the banks. Grandpa and two cousins, of course, went west to make their fortune during the depression as “robbers”. They chose a nice farmhouse and robbed a elderly brother and sister. But they were the nice robbers in the research papers. (They were obviously sober during this robbery). The said please and thank you. I am sure that great grandma who would not carry any Cottrell genes, tried her best with her boys and taught them manners at least. But since they were as good getting caught as they were at being stupid, Grandpa took the whole rap and was sentenced to 25 years in prison. Since Great Grandma, Jennie had tried to raise her boys right, Grandpa became a favorite of the wardens, trained his horse for him and when the warden shortened his sentence by ten years, gave him a dog to take back home with him. Grandma was a Blevins and she did not want her sons to be like her wild and woolly kin. A Legal perspective http://www.sharlot.org/library-archives/days-past/pleasant-valley-a-historic-and-legal-perspective/ They lived in Texas and took the feud to Arizona. I have come to terms that is was the hell-raisers who blew caution to the wind and went to new lands and the civilized people came later and established the law. Sounds like interesting folks, for sure!